Truer words have never been spoken. We were reminded of that upon hearing the judge’s recent decision on the Trail litigation. Hopeful, committed and positive gave way to disappointed, surprised and disbelieving. As you would expect, should The Trails Team decide to appeal the decision, we will be right there with them, as we have been, in our support for their efforts to keep those trails open and accessible forever. 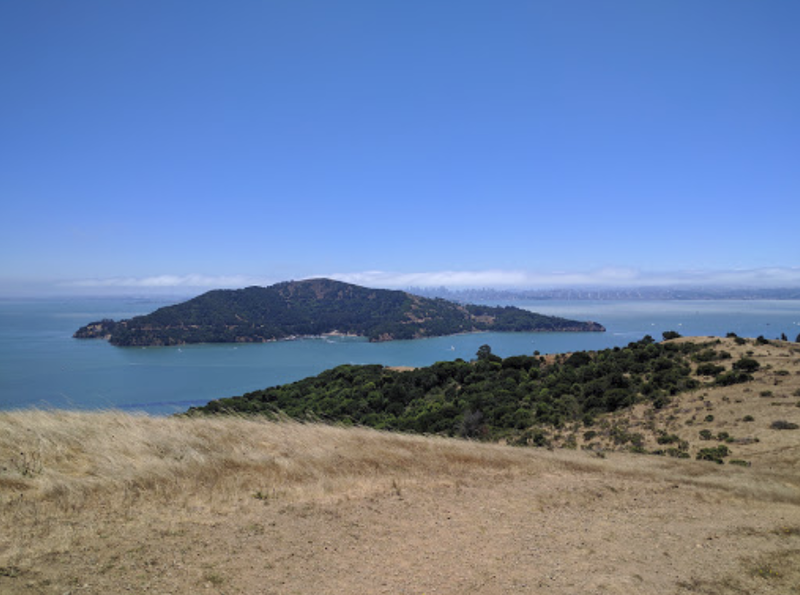 As Tiburon Open Space, what did we learn from it all? Among other things, we are reminded that there are forces at play that do not agree with us, have a different vision of the future, see Martha as a network of streets and fences and rooflines, compromised species and real safety risks. They see her separated from her past and closed off from our children’s future. We are resolute in not letting that happen. We vow to keep working on it. And it didn’t. We take enormous strength from their hard work, and thank them each time we walk on The Headlands. And as we contemplate the possible loss of Martha. We will continue to monitor environmental, water flow, fire and traffic safety issues as the family continues to list Martha for sale. We could use your help in not letting our collective guard down as we do so. It still takes dollars to make this kind of sense. “It ain’t the holidays 'til we say ’thank you.’” We hope that they are warm, safe and happy for you and your family. We can't let the quiet fool us. There’s a lot of work to be done. Hello. Don't let the silence deceive. There’s a lot going on. We sit and watch as the Martha Property has been put on the market. They are asking $1 million dollars per acre. While we are curious to see if a buyer of great wealth emerges, we won’t be holding our collective breath. It seems unlikely. Among other issues, a big mansion will have to conform to the existing building restrictions imposed by the county and confirmed by the Federal Judge. And there are the other impediments to development…those have not gone away. We will closely review any new housing plan and it’s environmental impacts. Throughout this period, we are seriously looking at how we can go about doing what we have always wanted to do: purchase Martha from the Reed family at a fair market price and keep it open, for all of us, forever. We continue in our efforts to identify resources (whom we must pay) to help us come to a realistic assessment/appraisal of the property’s value. And we continue in our efforts to identify sources and raise money to pay that fair market value the very minute the Reed Family decides to accept it. So, while it seems quiet, it really isn't. We ask you to help us in our efforts to raise the money we need to keep up the fight, and prepare for that day when we can write the check, close the deal, and walk that beautiful land whenever we want, with whomever we want. And always. Thanks. We look forward to speaking with you soon. Martha seems to have stopped pursing the 43 lot plan as no developer will pay anywhere near $110 million. Far too many permitting/environmental risks remain. Their new approach of pursuing a single residence will likely reduce environmental impacts and may result in increased public use. Encouraging but details are needed. We never completed the appraisal data gathering. We only want to do that if Martha works with us collecting the data. To date Martha has declined to participate in an appraisal. Likely Martha doesn’t want to be paid appraised value - they want to be paid more. The TRUST trails court trial has concluded and final briefs must be submitted by both parties by October 15th. The judge will then rule, perhaps a few weeks later. The CEQA environmental issues challenge is moving slowly. TOS has claimed that the document certified by the county in October 2017 does a poor job of analyzing and mitigating the traffic safety and biology and fire risk issues. The record which includes every comment letter and every study still has not yet been fully collected. The trial will likely be early in 2019. Meanwhile TOS is gathering the needed data to arrive at an accurate appraisal for the fair market value of the property. Please donate to help TOS with these important tasks. 1. Tiburon Open Space (TOS; originally the Last Chance Committee that led the 1990’s efforts to purchase and create Old St Hilary’s Open Space), is leading the efforts to save the 110 acre Martha property from development. TOS wants to increase the environmental protections on the property believing that the approved restrictions are insufficient for the impacts that development will have on biology, traffic and fire safety. 2. 1976. Marin County approves restrictions against ridge top development. Martha sues the County. A legal settlement ultimately allows 43 half acre lots, allowing some on ridge if no other options exist. It will be 20 years before the first development proposal is submitted. Of note, there are 26 landslides on the property, and both protected fauna and wildlife species. 3. After withdrawing the first two, the third development proposal is approved by the County October 3, 2017 with the same number of lots and ridge restrictions. The County’s approval comes with restrictions based upon its power to lessen environmental impacts: house height restrictions are imposed, and 3 lots are moved from the ridge to near Paradise Drive. 4. July 2018, Martha challenges the imposition of these restrictions, but a Federal Judge confirms them. 5. TRUST—Tiburon Belvedere Residents to Support the Trails—awaiting September 4, 2018 trial as it has sued Martha to protect community access to its trails, trails that have been open and used for decades. 6. July 2018, The Town of Tiburon joins TOS in its environmental impacts legal challenge. Trial is set for January 30, 2019. (See www.TiburonOpenSpace.org). 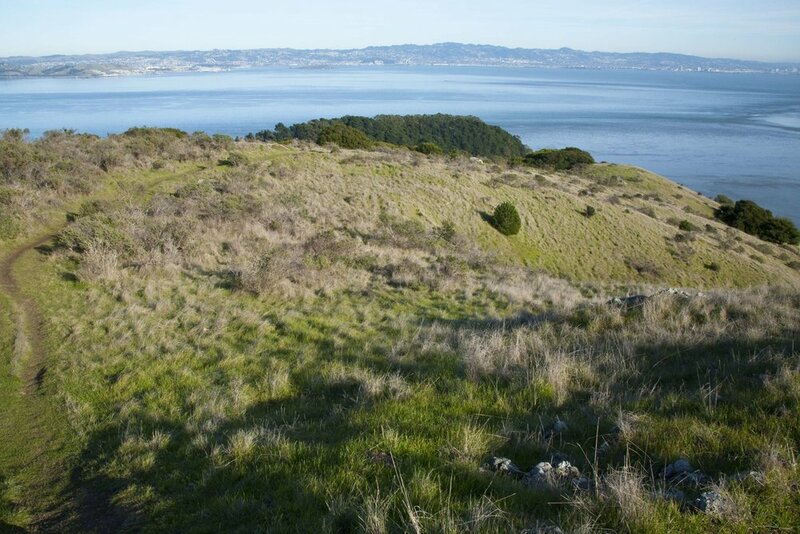 Tiburon Open Space seeks to purchase the Martha property at full appraised value, with the goal of keeping Martha open space, for all, and forever. Full appraised value includes the cost to mitigate impacts (e.g., two new large water tanks are required to provide domestic water as well as a fire flow for fires; protection of sensitive habitat on the property; and the repair of many of the landslides areas). These costs, and many others, are similar to the repair costs that a seller must bear when selling their home. To the friends of Tiburon Open Space. Have you got a minute? Or maybe just a few more? On Tuesday, August 7th, an important, informational meeting will take place at Tiburon Town Hall. 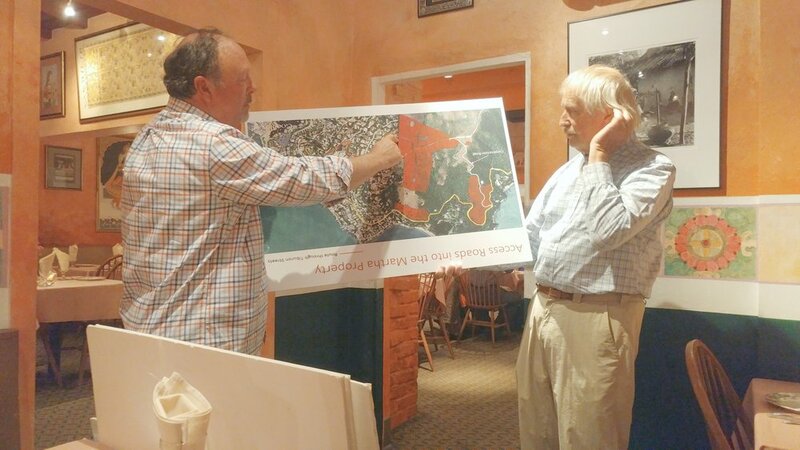 TOS will update on developments that have occurred as the Town of Tiburon has now joined in the effort to address remaining environmental impacts relating to biology and traffic safety. If you care at all about this work and community effort to save this property, please, please come and join in this event. Thank you for supporting this work and efforts to keep beautiful Martha open to all and forever. We have some very good news! Federal Judge Saundra Brown Armstrong, Senior United States District Judge for the Northern District of California, has issued her ruling regarding the disposition of the Martha Property. And the judge ruled 100% against Martha’s demands. Jerry Riessen, the Tiburon Open Space President, captured our thoughts rather succinctly: “The decision could not be better for us!" Every one of the restrictions the County imposed upon the development were fully upheld. As a result, three houses must be moved off the ridge line, and many houses will now have height restrictions. The lot lines along the ridge will be moved to retain the current ridge trail, and house square footage will not be determined until the Design Review phase, long after all the infrastructure is built. This is a significant ruling and development. It brings new life to our hope of one day purchasing Martha. And, of course, our work goes on through each subsequent phase. The challenge to the Environmental Impact Report (EIR) is ongoing. We need your help with that. This ruling will allow us to begin the necessary, expensive appraisal process. We will need your help with that. When that is accomplished, we will finally be close to making a full, appraisal-based offer to purchase the Martha Property. When successful, we will keep our promise to keep her beautiful and open forever. We look forward to that, and to hearing you. With those words, Jerry Riessen, the leader of Tiburon Open Space Committee, announced a new challenge to the development of the Martha property. The Town of Tiburon has petitioned to join our lawsuit against the County that challenges its approval of the environmental impact report and revised master plan. Here's the full story in the Marin Independent Journal. We urge you to read this brief article in its entirety. This is great news, and we are grateful for their joining hands with us. To those of you who have been on this journey with us, the joining of the Town of Tiburon and the Tiburon Open Space Committee in this suit will bring much needed and additional resources and clout to bear on the County. For those of you who may just be learning of the planned development, and the significant threats posed by fire, environmental and traffic safety threats, we hope that you will join us in our efforts to save Martha from development. For all of us, with big legal challenges come big legal bills. We are asking you to dig deep for donations. Both small and, hopefully, large. We are encouraged by this development, but we realize the uphill battle we face. We’d ask you to explore the depths of your pockets if you possibly can. Thank you. Let’s keep talking and working and keeping this issue front and center. And, thanks Tiburon! Together, we can save Martha. The feelings you just enjoyed have been brought to you by Martha. They are a reminder to us all of what we are fighting for. As court rulings approach, we ask you to deeply consider what this property means. Please look at the images again. They are real and, quite possibly, lost. Don’t let this momentary silence deceive. We ask for your active and continued support to save her. More than ever, she is worth fighting for. There are occasionally events that we think you would find enlightening and entertaining. We are happy to share one with you now that is particularly relevant given the recent developments concerning The Martha Property. On November 14, 2017 you are invited to the free monthly Marin Green Drinks business mixer in downtown San Rafael. 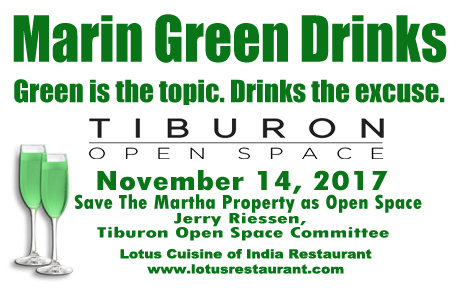 Jerry Riessen from the Tiburon Open Space Committee will be the guest speaker. His topic will be "Save the Martha Property as Open Space.” Jerry will share his thoughts on the only major parcel of open land that remains on the Tiburon Peninsula — the magnificent 110-acre Martha Property. Marthais privately owned and, just a few days ago, the Environmental Impact Report was certified by the Marin County Board of Supervisors. You'll also get a chance to mix and mingle with North Bay green business folks and taste some organic food, beers and wine. Marin Green Drinks is hosted by Jody Ceniceros and Alex Kahl. The event is held at Lotus Cuisine of India. This restaurant is a certified green business which is consistently rated one of the best restaurants in the Bay Area. Join us on November 14 at 5:30 PM. Bring business cards, a colleague or friend, and be sure to RSVP here.